You all remember CraftHaus right? Back in May, I had the wonderful pleasure of meeting with (and drinking with!) 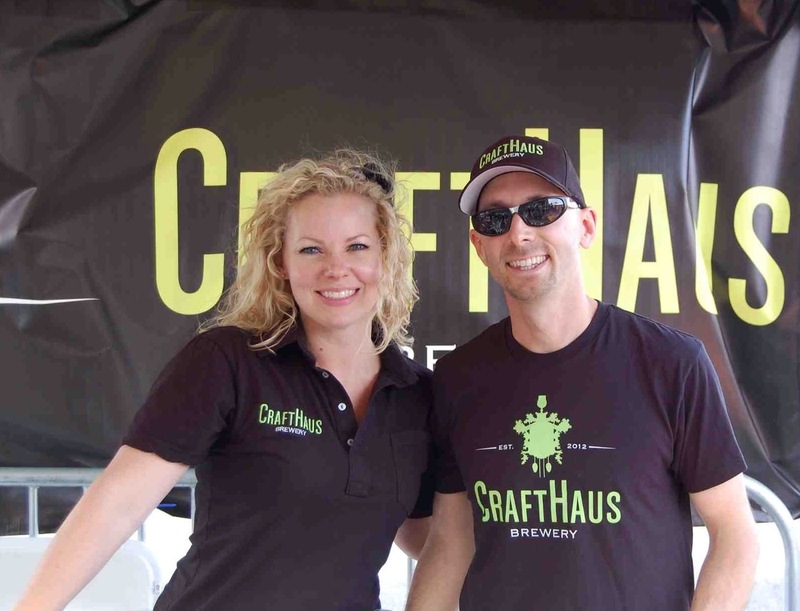 Dave and Wyndee Forrest, founders of CraftHaus Brewery. At that time, they were just launching their Kickstarter campaign to help with the final funding of their brewery. They’ve since surpassed their goal, and have been sitting quiet while they prepare for their grand opening. Not satisfied by simply waiting for the brewery to open, I’ve reached out to Wyndee to catch up on where they are in the process, and to get their thoughts on what it’s like to start a business. Hooked on Hops: What were your thoughts after you saw that you reached your Kickstarter goal? Wyndee Forrest: Elation! I knew our goal was attainable with diligence and hard work, but it was a big relief to meet our goal four days before our project ended. Then came the thought, “wow, now we have a ton of work to do, not only to fulfill our rewards but to build a brewery!” We knew our community was ready to receive CraftHaus, but it was an honor to see the proof. HOH: Prior to starting your Kickstarter campaign, you met with Tomme Arthur, of The Lost Abbey, and Patrick Rue, of The Bruery, during your planning stages. Have you reached back out to them following your success to discuss next steps? WF: Yes, we met with Tomme and discussed the interplay of investors versus partners. He gave us some sound advice which we value immensely. We also saw Patrick last month in L.A. and he always has helpful information on navigating a start up brewery. He also helped us with some questions we had regarding equipment. It is a wonderful thing to be in an industry that is supportive of not only fellow breweries, but new comers too. Both Tomme and Patrick are a great source of inspiration. To have their help is an honor. HOH: Since you exceeded your Kickstarter goal, will you be purchasing barrels for aging beers in? WF: YES!! Both Dave and I enjoy barrel aged beers and have always planned on offering them in our line up. We plan on barrel aging our anniversary beer. HOH: What has been the most frustrating aspect about opening a brewery? WF: Navigating all the licensing. The city of Henderson has been extremely accommodating, but the whole process can be daunting. HOH: When is your target launch timeline for CraftHaus? WF: Soon. Is that diplomatic? There are so many variables that are out of our hands, so it is too hard to nail down a date right now. No one wants to open sooner than us! HOH: Aside from the actual grand opening, what are you most excited about with opening CraftHaus? WF: Building a community. Getting to know the people around us and offering them our hard work in a pint glass. Educating people about craft beer is our passion. We love to talk, share, and learn about craft beer. Everything from the brewing process, ingredients, history, tasting, pairing…there is so much we have to share and we still love learning too. HOH: Have you developed any new beers that you are excited about? WF: Yes, we just launched 6 Bushels IPA at The Downtown Brew Festival. It is named as such for the six hop varieties we used to create it. We got a really good response. The hop varieties are: Centennial, Chinook, Cascade, Warrior, Citra, and Simcoe, and dry hopped with Centennial. HOH: You just poured your beers at the Downtown Brew Festival, when is the next time that people can taste your beers? WF: We do not have any other tastings planned as of right now because we are focusing on opening. We are excited to open our doors to our community and can’t wait to make them proud!